← The Key’s Coolest Shark! I’ve always wondered what those white plastic poles were sticking out of the water throughout the keys… now I know… and you will too! 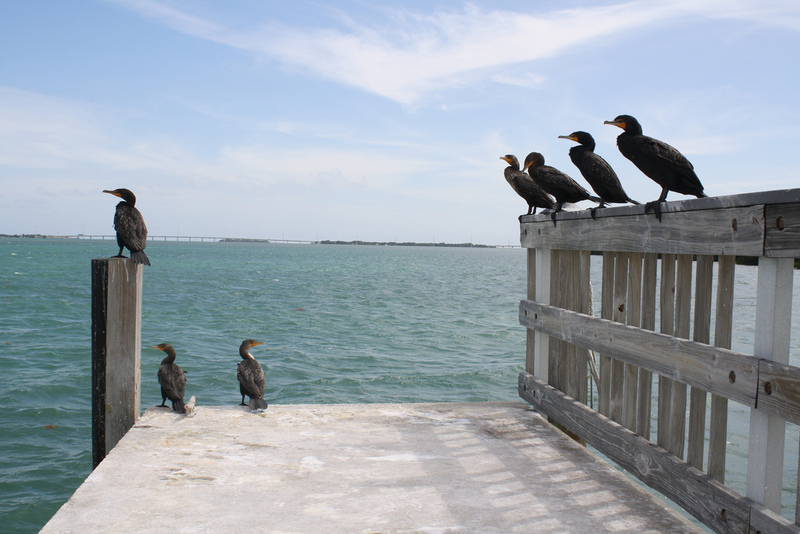 While on a catamaran on our way to Lignumvitae Key we past several areas where birds were roosting on stakes pitched in the ocean as I began to question their purpose. In speaking with a park ranger I learned that those are seagrass regrowth areas brought about by boating accidents, propeller scars, and running aground. If caught, as this gentleman was, the park ranger said he was fined $27,000 and forced by the courts to pay it for destroying the seagrass bed by running aground! There’s a standard three-step process in recovering these vital marine habitats, they are: Sediment fill for deep scars, transplanting of nearby seagrass, and bird stake roosts. We’ll focus on the latter, bird stake roosts. 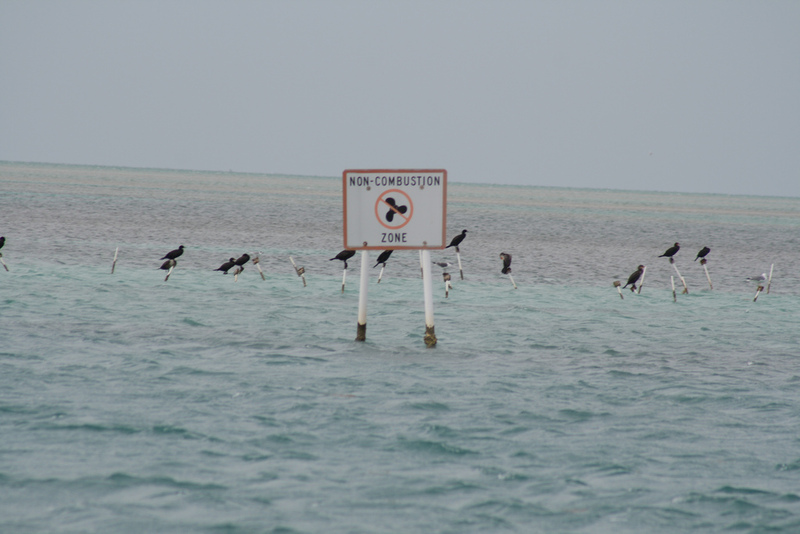 Bird stakes are used when the injury occurs in less than 5 feet of water. 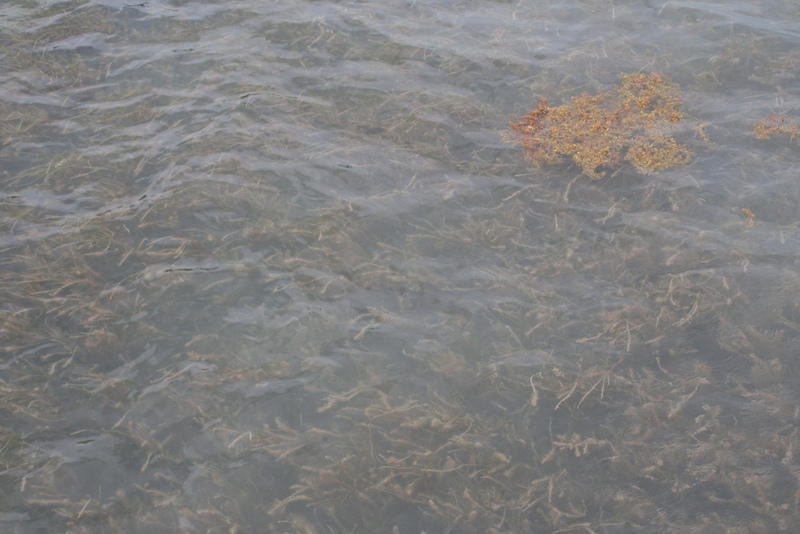 Like all plants, seagrass need nutrients to grow. It’s possible to encourage faster regrowth of seagrass in an injured area by fertilizing it with the needed nutrients. However, chemical fertilizer is expensive and needs to be replaced every few months. An alternative is to use a free, natural source of fertilizer—bird feces. Once an injury has been returned to grade with sediment fill, scientists install bird roosting stakes throughout the injury. These bird stakes extend about 10 inches above the high water level mark. After a hearty meal, birds come to rest on the stakes—and do what birds do after eating. The feces deposited by the roosting birds reach the bottom in concentrated doses, naturally fertilizing the area to encourage seagrass regrowth. Bird stake roosts are removed after approximately 18 months of the restoration process.